Okinawa is the southernmost prefecture of Japan, containing hundreds of islands spanning over 1,000 kilometres long. Showcasing an unseen side of Japan, these tropical islands are scattered with superb beaches surrounded by mesmerising coral reefs, taking up just 0.6% of the nation’s landmass. Translating to ‘rope in the open sea’, in reference to its slender shape in the Pacific Ocean, Okinawa has long been a favoured destination for the Japanese, with foreign visitor numbers still relatively low compared to the mainland cities. The prefecture itself can be separated into three main groups: the Okinawa Islands, Miyako Islands and Yaeyama Islands. Popular for winter breaks, the subtropical climate allows year-round warmth. But the most ideal time to visit is early spring, with less rainy weather and you’ll avoid the long succession of national holidays taking place at the end of April. 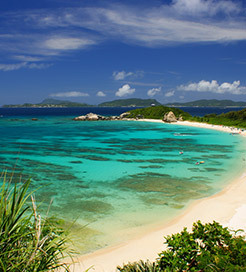 Although breath-taking beaches are found all over, some of the finest can be found on Amami-Oshima, the tiny islets known as the Keramas, and Miyako-jima. For wonderful coral reefs, the Yaeyamas, furthest south, are the clear leaders with the best in the country alongside dense jungle and peculiar mangrove swamps. With the native culture of Ryukyu still deeply embedded into the way of life, Okinawans consider themselves independent from the mainland, speaking their own language and following different customs. While karate is the most famous export, Okinawa also produces a significant amount of pop musicians, with the most distinctive local instrument, the sanshin, resembling a three-stringed relative of the banjo. Japanese ferries are some of the most advanced in the world, boasting the latest safety technologies and high-speed features. Okinawa, with its vast number of islands, is unsurprisingly well linked by ferry, which is easily the best way to get around the different island groups. Operated by numerous excellent companies, the inter-island routes in Okinawa can last as little as 15 minutes, depending on your destination.